Following in her footsteps, Danielle has also used her wellness champion role as a catalyst for helping staff in Medical Oncology. Her approach has been very motivating: “The goals I have for my work group is to not only just make small progress with each person to do a little more than they normally would, but also to bring together our unit to work together outside of work...since most of our staff is new.” Walking Wednesday was not only a perfect opportunity for her to rally her work group, but to also a great opportunity to enjoy physical activity with her mother. 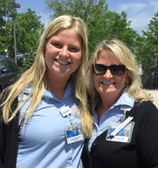 Join Marilyn and Danielle, along with their colleagues, today at Walking Wednesday. This program encourages Mayo employees to be active and walk over the lunch hour from 11:15am-1:30pm on Wednesdays during the summer. Check for more details here. Interested in becoming a Wellness Champion or learning more about Worksite Wellness resources? Click here to learn more.